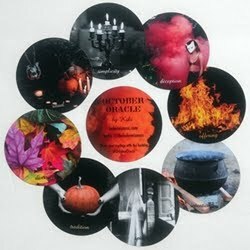 The Halloween Tarot in Tin is a fun, family-friendly deck that can be used all year round. 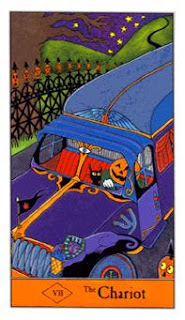 Although October is the obvious time to pull out this deck, it certainly need not be reserved for Halloween time. 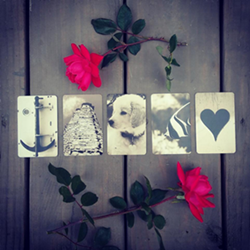 I have used the deck with enjoyable readings smack dab in the middle of Spring! 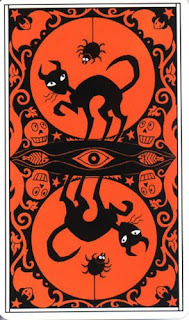 There are two versions of this deck. The one I have is the pocket sized version which comes in a tin (like its cousins the Vanessa Tarot and Gummy Bear Tarot*). 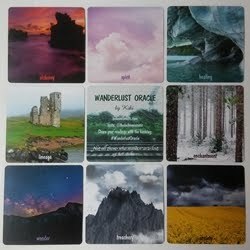 The cards have a matte finish, which I love, and they shuffle beautifully. There is also a companion book (sold separately), which I don't own, but hear is good. *US Games has since presented many more decks in tins since this review was first written. 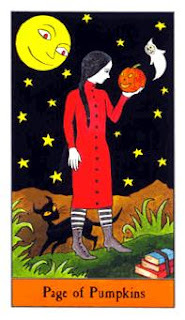 The artwork in the Halloween Tarot is cartoony and the coloring is very vibrant. The scenes take place at night, so the skies are all black, which gives the deck a fitting atmospheric feel. 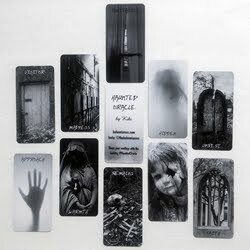 The deck is RWS based, so most of the cards are instantly recognizable, and readable right out of the box. 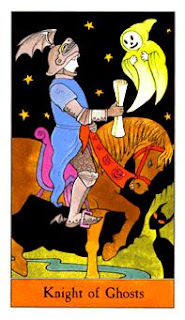 There are only a few exceptions where the cards stray slightly from the norm. 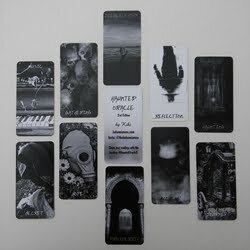 Within the deck are familiar references to various horror genre characters, such as the Bride of Frankenstein, Wednesday Addams, Dracula, etc. There are also your garden variety of recognizable monsters and creatures of the night. There are depictions of Vegetable People included, which were German-made toys popular in America in the 1920's. 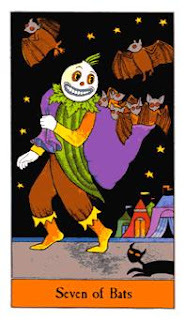 Familiarity with the Vegetable People isn't necessary to work with the deck, as I hadn't heard of them before, and they blend right into a typical Halloween scene. 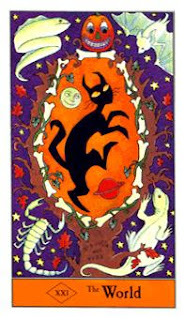 There is a also black cat which follows you around, as it is featured in every card in the deck. 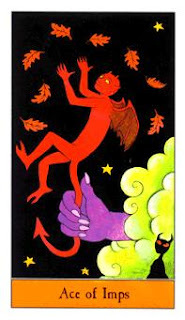 The Death and Devil cards are not scary in this deck, which makes it inviting for people of all ages. 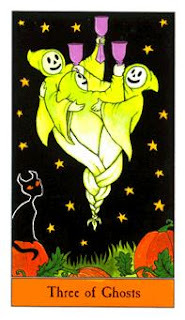 Death features a happy go lucky skeleton watering his garden with a big smile on his face. 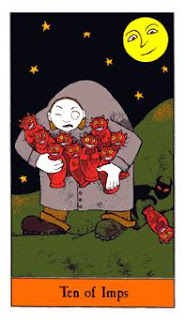 The Devil shows a female devil-woman, also with a nice smile, holding three little human-like creatures on loose leashes. 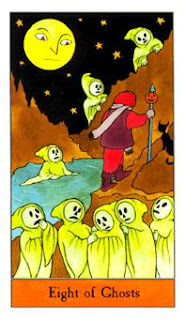 I find the Halloween Tarot to be very honest in its readings, yet still able to get its message across with an occasional sense of humor (see the fabulous Ten of Imps to the left). 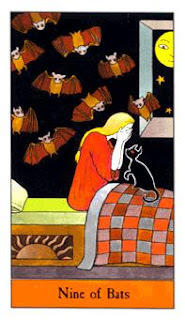 It's not a deck I would select for a deeply, emotionally serious reading. But for inquiries that are less dire and could withstand a tone that can be campy and unconventional, this is a great choice. 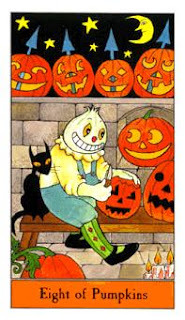 It's easy to read stories within the cards, which makes for a fun reading when combining your storytelling with Halloween images. 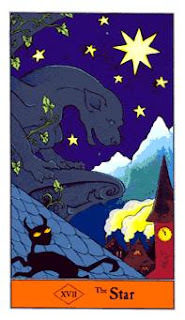 The Little White Book which accompanies the Halloween Tarot in Tin is semi deck specific, however it unfortunately doesn't go into detail on the illustrations themselves. Keywords for reversals are not given. There is a brief intro written by the author, and the typical LWB spreads (Three Card and Celtic Cross). 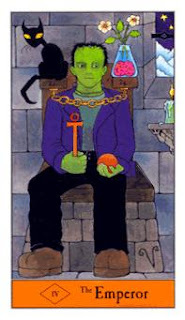 This is definitely a deck you want to get if you plan on doing Halloween readings for an audience of varying ages. It's also a fantastic reading deck for any time of the year. It's a fun deck to use, and an entertaining variation of the RWS. 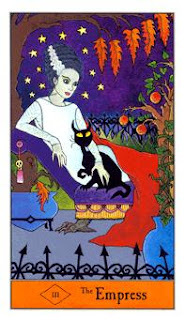 Card Size: 2 1/4" x 3 3/4"
This deck review was originally published on my previous blog (Tarot Dame) on 10/31/09.